Kanagram is a game to play anagram or solve jumbled words. Kanagram features several built-in word lists, hints, and a cheat feature which reveals the original word. Kanagram also has a vocabulary editor, so you can make your own vocabularies, and distribute them through Kanagram’s KNewStuff download service. 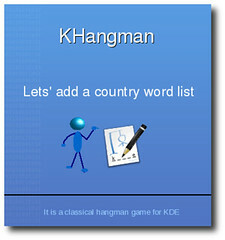 After burning some midnight oil yesterday, I finally completed the first cut of my presentation regarding “lets add a country word list in khangman”… you will definitely find this interesting. Download it from here. Also please post the much needed comments & suggestions for improvement. See you at freed.in 2008, New Delhi. I finally finished up the bangla version of my kgeography presentation “চলো আমরা ভারতবর্ষের ম্যাপ এ্যাড করি…”. Download it from here. As a follow-up of my last post Insight into KGeography, I would like to publish the completed release of my presentation regarding “lets’ add the map of India in kgeography”. Download it from here. Also, do post any comments or suggestions for improvements. Update: Here’s the first cut of the bangla (বাংলা) version of this presentation. Though its’ still half-complete, have a look. Will post the completed version soon. Download it from here. Also, post much needed comments & scope of improvements. Btw, had some rough times with openoffice. The theme which i used in the original presentation won’t render bangla fonts. So, i had to recreate lot of thing all over. KGeography is a geography learning tool integrated with KDE-Edu. It helps a student to learn geography in a playful way. But it still doesn’t has all the maps as yet. How to add them? For adding a new map in KGeography, we need two things. One, the map (say in a file called mapname.png) and secondly, a kgm file (whose name should be mapname.kgm) to integrate the map with kgeography. Once we have them we can easily add them in its’ home directory (default: /usr/share/apps/kgeography). Now, what kgeography does is an image-processing. It distinguishes a division of the map by its’ RGB values. Then it identifies the division by Name, Capital, Flag etc parameters given in the kgm file for that division. 1. First, create the map using GIMP, Kolourpaint or any other picture editors. Getting a political outline will be the best idea. I couldn’t get one atleast for India. So a good idea will be superimpose a blank outline map over a descriptive political map (in two layers to be precise). Assign separate colours for every division. Care should be taken that no two regions should have same colours. Ofcourse, handdrawn & scanned political outline maps may be an option and there is no real restriction on the scale of the maps. <mapFile> and </mapFile>: the name of the file (without any path) containing the map image, e.g. “india.png”. <name> and </name>: the name of map, e.g. “India”. A <division> and </division> for each division in the map. <name> and </name>: the name of the division, e.g. “West Bengal”. <capital> and </capital>: the name of the capital of the division, e.g. “Kolkata”. <ignore> and </ignore>: can be set to yes, allowClickMode and no. If this tag is set to yes then the division will be ignored when asking for divisions in that map. It is then as if this division does not exist in KGeography quiz modes. If this tag is set to allowClickMode then KGeography will ask for the division in the Click Division in Map… mode but not in other quiz modes. Setting this tag to no means the division will appear in all modes (browse and quizzes). This tag is optional and when there is no <ignore> tag that means as it is set to no. For example “Egypt” has this tag set to yes in the “Asia” map which means that “Egypt” will not be part of any quiz in the “Asia” map. Also this tag is set to yes for frontiers or oceans. <flag> and </flag>: the file (without any path) containing the flag of the division, e.g. “india.png” in asia map. This tag is optional. Not needed for the divisions whose <ignore> tag is set to yes. <color> and </color>: the color the division has in the map. <red> and </red>: red component of the color. Valid values are between 0 and 255. <green> and </green>: green component of the color. Valid values are between 0 and 255. <blue> and </blue>: blue component of the color. Valid values are between 0 and 255. All names should be in english. But when number of divisions are too much it will be better to automate the task of creating kgm file with a bash script (will post lil’bit later). I checked out the helper tool in kgeography handbook which wasn’t effective enough even on the existing maps. Update: Now, this post may not be enough to dive into this work. So, I created a sort of presentation concentrating on how to add the map of India. It’s still unfinished. But you can have the first cut from here: [http://makghosh.googlepages.com/addmaps.pdf]. The best way to see it is as a presentation in kpdf. 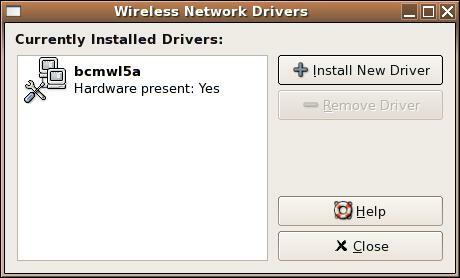 Many vendors do not release specifications of the hardware or provide a Linux driver for their wireless network cards. The ndiswrapper project implements Windows kernel API and NDIS (Network Driver Interface Specification) API within Linux kernel. A Windows driver for wireless network card is then linked to this implementation so that the driver runs natively, as though it is in Windows, without binary emulation. With ndiswrapper, most miniPCI (builtin), PCI, PCMCIA (Cardbus only) or USB wireless network cards work in Linux with x86 or x86-64. Although ndiswrapper is intended for wireless network cards, other devices are known to work: e.g., ethernet cards, USB to serial port device, home phone network device etc. I got into this matter because one of my friend bought a Compaq Pressario V6425TU laptop but the Wifi (wlan vendor: Broadcom) won’t work in F7. The latest stable version is 1.48. It can also be yum-installed from livna repository. If you don’t see this, try a different driver such as the drivers for Windows 2000, or another driver matching the PCI ID on the ndiswrapper list. The installation of driver can be done easily by a GUI ndisgtk. Now with # ifconfig or # iwconfig the wifi card will appear with an interface name like wlan0. If wlan0 is shown then wifi is working!! We can then create a network connection. Then we added the most crucial line in the nVidia driver section of xorg.conf. By default, HWCursor is on.